Your liver is the processing plant of your body: Its job is to designate nutrients like proteins and fats for use and to send the toxins that result from protein breakdown to your kidneys. However, excess proteins and fats in your diet can be harmful to your liver, causing a slowdown in the organ's processing output, a not unlikely occurrence if you consume excess amounts of red meat, which tend to be high in proteins and fat. Knowing how red meat can affect your liver can help you maintain your health. Always consult your physician before making any dietary changes, however. Because your liver is responsible for breaking down and packaging proteins, it will break down red meat in your diet. If you are a healthy individual, your liver should be able to break down these foods with little difficulty. However, the long-term effects of excess red meat intake on your liver are uncertain at best, according to MayoClinic.com. Thanks to the increasing popularity of high-protein, low-carbohydrate diets, it is possible that long-term excess consumption of red meat could worsen liver problems. While your liver can break down proteins, if you eat too large a serving, it may not be able to break them down adequately. If your body cannot break down red meat properly or you consume a greater than manageable amount of red meat, the waste products can build up. These toxins can affect your brain functioning, contributing to a condition known as hepatic encephalopathy. Because each person may react differently to red meat intake, pay attention to your body for signs like mental confusion, fatigue or dizziness when you eat red meat. In addition to being high in protein, red meat is high in fats, which can be troublesome for the liver. "Even the leanest cuts of meat are high in fat content," according to Melissa Palmer, M.D., a physician writing on LiverDisease.com. "In fact, approximately 50 to 75 percent of calories from most red meats actually come from fat." While you should have some aspect of fats in your diet, red meat contains saturated fats, which can contribute to high cholesterol and heart disease, and can be especially harmful when you have liver disease. When you have liver disease, certain proteins may be better tolerated than others, according to the Hepatitis Foundation International. If your liver disease is advanced and your liver is able to break down few proteins, red meat may not be tolerated as effectively as vegetable and dairy proteins. Talk to your physician about how eating red meat may affect your stage of liver disease. 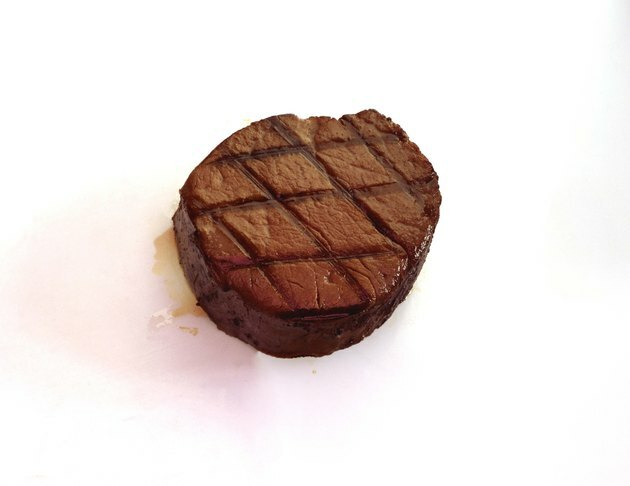 Your physician may recommend eating a small serving size of lean red meat -- about 4 oz. -- as an occasional option. How Does Red Meat Affect the Kidneys?